July 20, 2013 2 comments on "Canning Corn Salsa"
I have to admit that I have never had corn salsa before. I love homemade salsas, however, so I decided to give it a try. What’s great about this recipe is that although you need a pressure canner to can corn, you don’t have to pressure can corn salsa. The lime juice in the recipe raises the acid level enough that pressure canning is not required. This recipe makes about 2 pints or 4 half-pints of salsa. Note that this recipe does not HAVE to be canned. You can prepare the recipe and store it in the refrigerator without canning. The salsa will store in the refrigerator for a couple of weeks. If you have never cut the kernels off of an ear of corn before, don’t worry, it’s really easy. First remove the husks from the corn. Use a vegetable brush to scrub the ears of corn to remove any remaining corn silk. Rinse the ears of corn. Using a sharp knife, hold an ear of corn at an angle and slide the knife down the length of the corn cob, cutting off the kernels of corn into a bowl. Press firmly, but do not press so hard that you cut into the corn cob. You just want the corn kernels. After you have scraped the corn cobs, measure 2 cups of corn kernels. In a large sauce pan, combine the 2 c. corn kernels, onion, bell pepper, tomato, jalapeno pepper, lime juice, salt, cumin, and black pepper. Bring the mixture to a boil and reduce heat. Simmer, covered, for about 10 minutes. Ladle the hot salsa mixture into sterilized pint sized canning jars, leaving 1/2-inch head space. Wipe the rims of the jars with a damp towel, and then place the sterilized lids and rings on the jars. Place the jars in a boiling water canner, and then cover the jars with water so that there is 1-2 inches of water covering the jars. Bring the water to a boil. Process the jars for 15 minutes. Remove the jars from the canner and let cool on a towel on the kitchen counter. Make sure the jars have sealed before storing. Unsealed jars can be placed in the refrigerator and should be eaten in the next couple weeks. 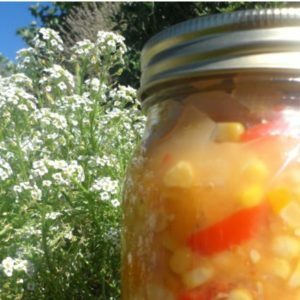 Your jars of corn salsa can be stored for 1-2 years. 2 Comments on "Canning Corn Salsa"
The note says there is vinegar but it is not a listed ingredient.